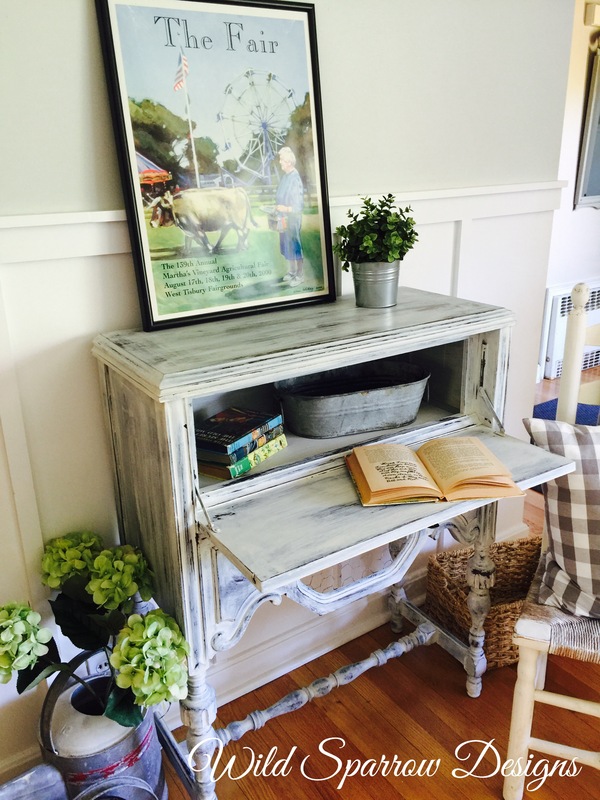 Old Fashioned Milk Paint July Fab Furniture Flippin’ Contest “Farmhouse Fun”! 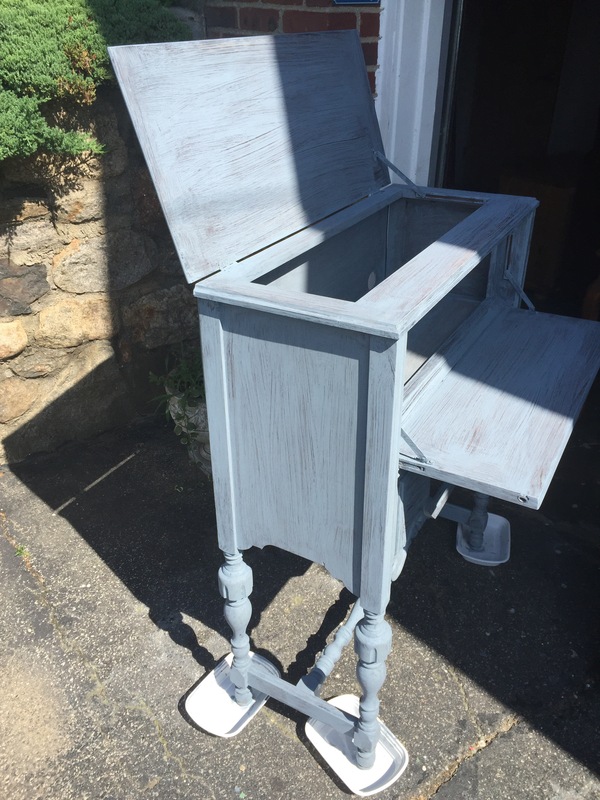 It’s been such a hot and humid summer so far on Long Island, but nothing could dampen my spirits when I finally received my Old Fashioned Milk Paint in the mail through participating in the Fab Furniture Flippin’ Contest! 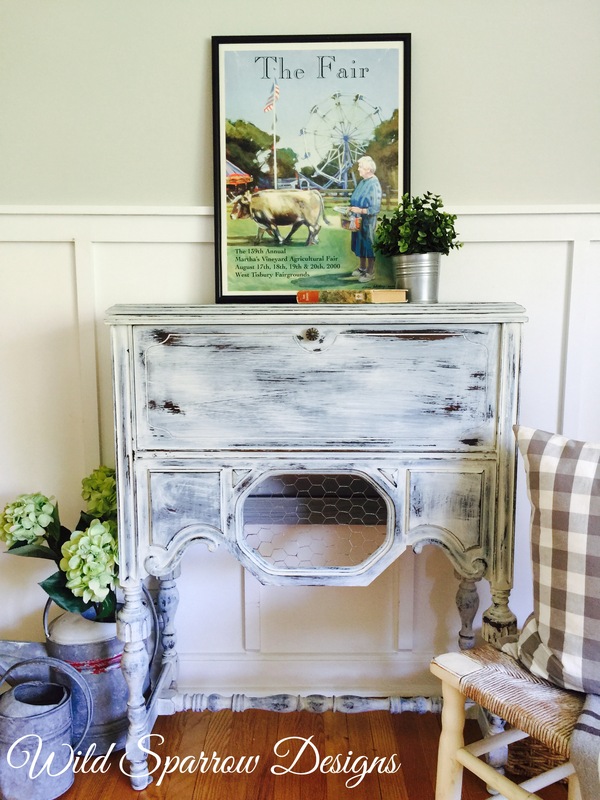 This month’s theme is “Farmhouse Fun”! 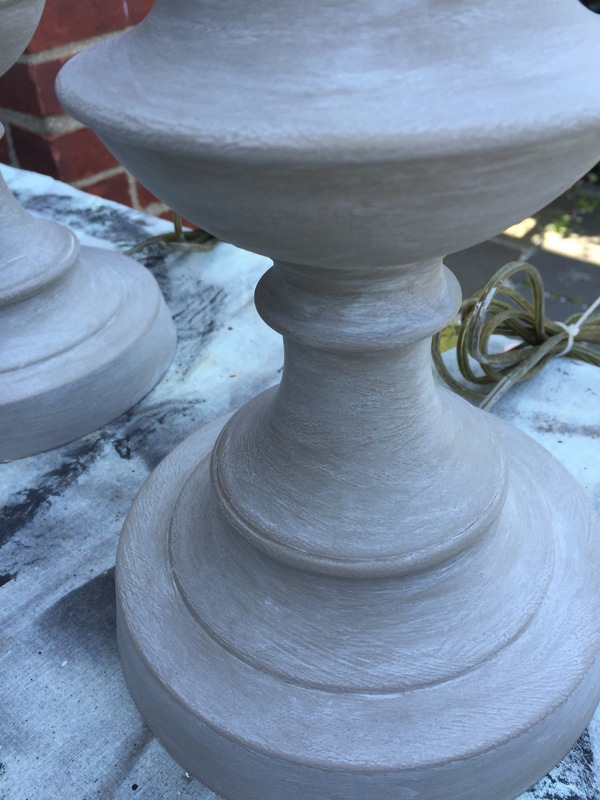 I have never worked with Milk Paint before and I had heard so many wonderful things about it, I couldn’t wait to give it a try! The colors I chose were Slate and Light Cream. The packaging is totally adorable and they give you very detailed instructions on how to create the perfect milk paint finish! I love the little bags it comes in too! You can mix up as much or as little as you need. It’s VOC free, and has no fumes or chemicals. The product comes as a powder, and you mix it with warm water. 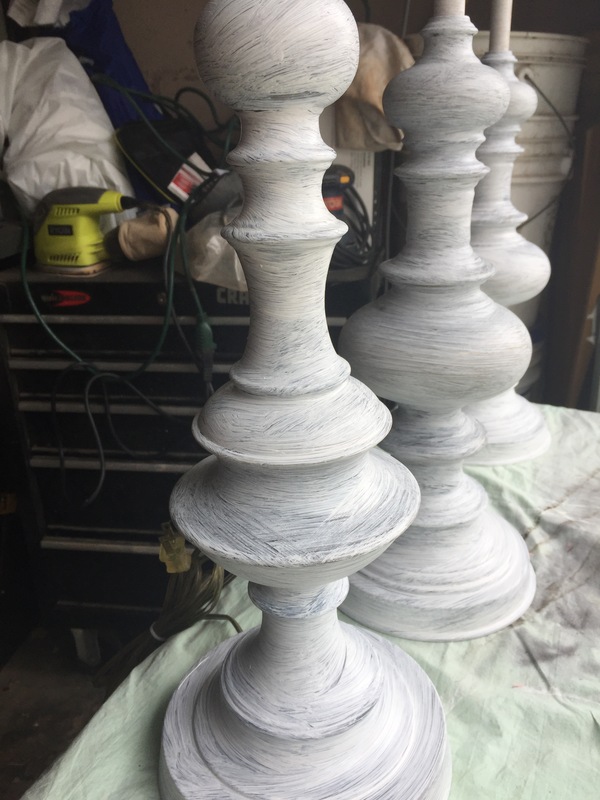 I wasn’t sure if I wanted a chippy finish or not on my piece and because milk paint lends itself to a more weathered finish, I decided to also get the extra bond which helps the milk paint adhere to the surface much better. 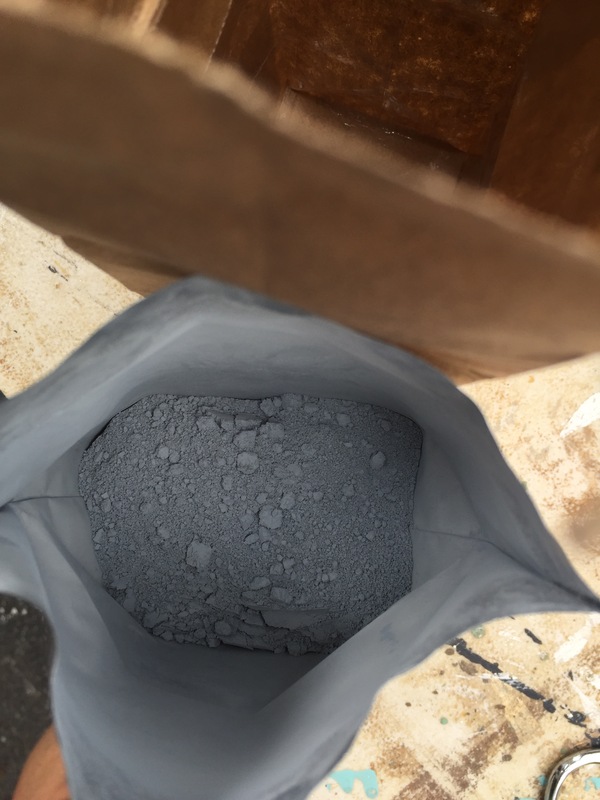 Here is the color Slate in the powder form. 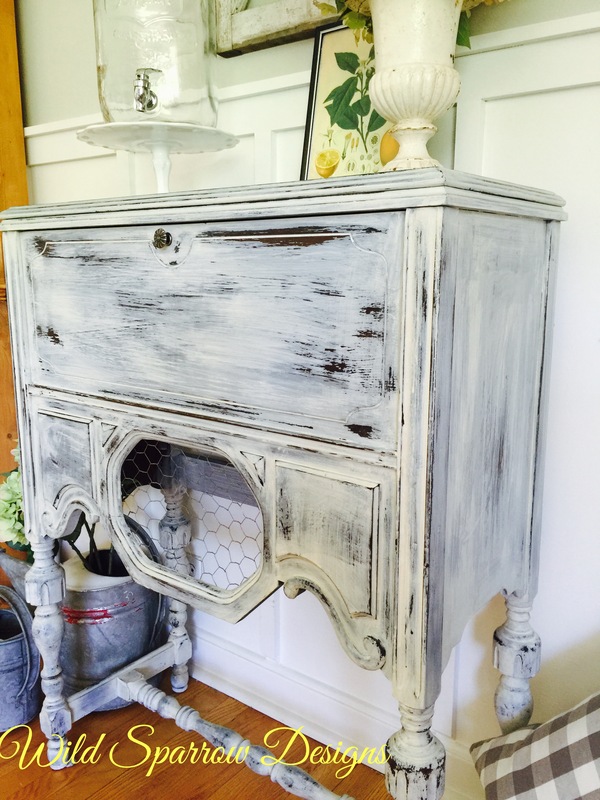 This is the piece that I decided to use the Old Fashioned Milk Paint on. My very dear friend gave it to me! 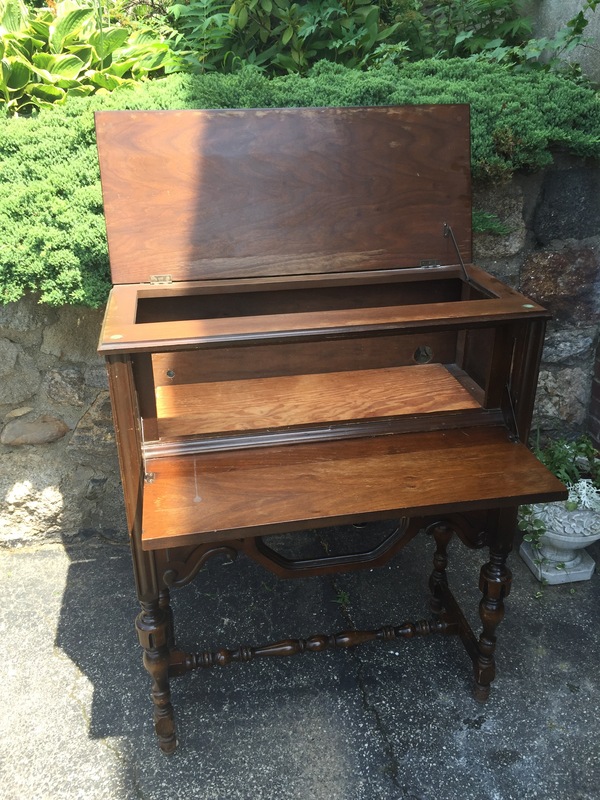 It’s an unusual piece, sort of writing desk/bar. I thought it would be the perfect style for the Farmhouse Fun theme! I finally decided I wanted to do a chippy, finish with a two-tone color with the wood coming through as well. Is it a bar? Is it a desk? Who knows? But its fabulous nonetheless! I decided to show it being used for multiple uses. I was so excited to get started. Here is the first coat of the Slate color with the bonding agent added. It goes on a little streaky, but after the second coat, it was fully covered. A little goes a long way. Because it has been so humid, I had to bring it inside to paint the second coat! I used the Light Cream after the second coat of the Slate was dry. 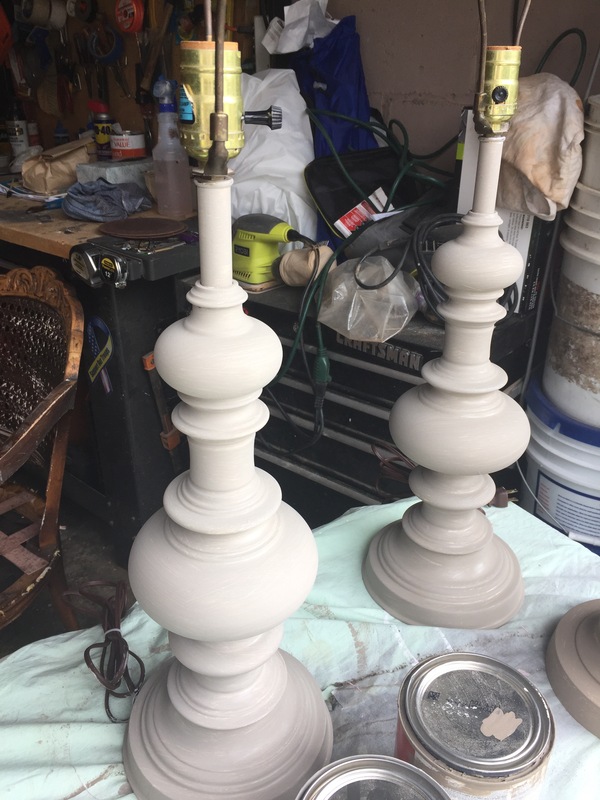 I painted 2-3 coats of the Light Cream color. I think I may have used too much water when mixing up this color because it took more coats to cover. It was more of a washy effect, but it actually worked out better that way! Here it is after the final coat of the Light Cream. 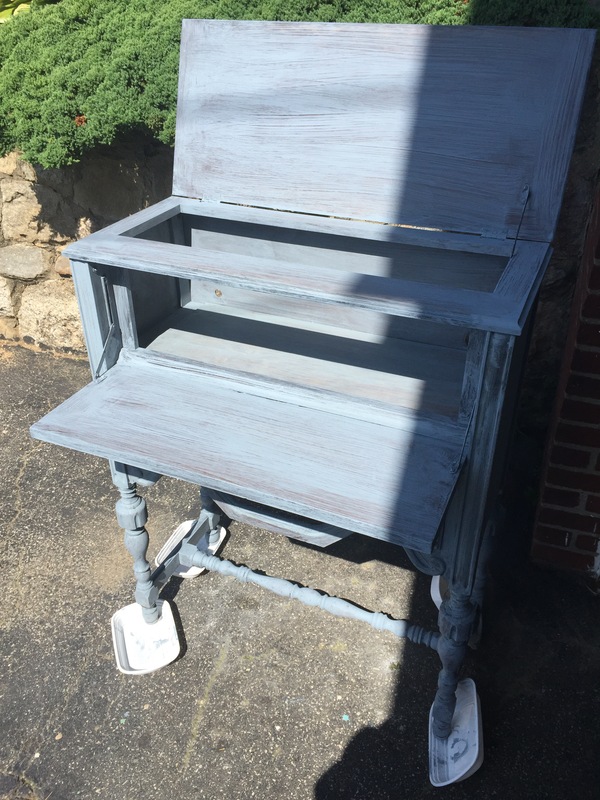 I didn’t let the last coat dry fully because I knew I wanted a chippy finish but I wanted the Slate blue color to show through as well. 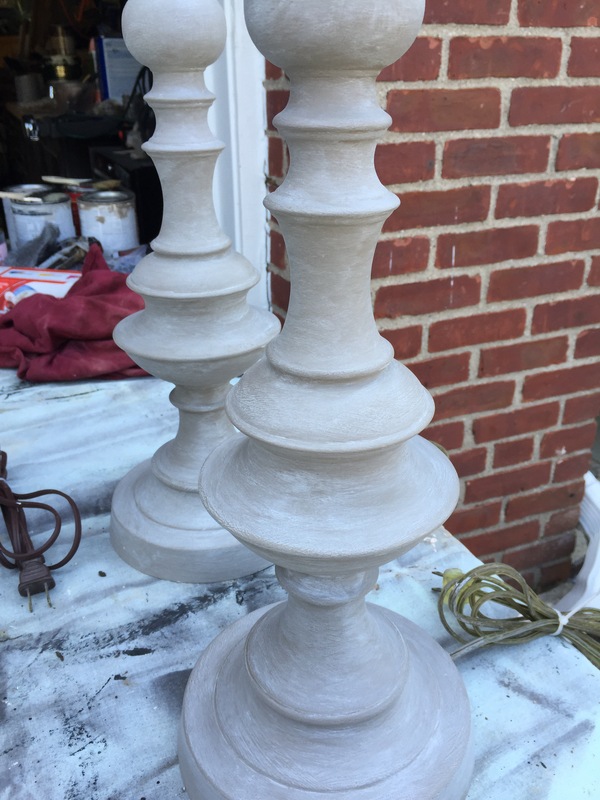 I started using my coarse sanding sponge, but it was taking off too much paint for my liking. I decided to wet distress using a Dobie pad instead. I got a dish pan and some water and started rubbing off the Light Cream color to reveal the Slate underneath. This was a new technique for me…it was really trial and error, but aren’t all projects like that? It ended up coming out exactly the way i envisioned. Happy Accident! Because I had used some of the Bonding Agent in the paint it adhered more to the wood, but I was fine with that. I didn’t let the final coat of the Light Cream dry fully so it didn’t take that much pressure to remove the top layer of paint. It came out unbelievable! Here is the final result after I finished wet distressing with the Dobie Pad and water. Just what I wanted! A closeup of the finish. 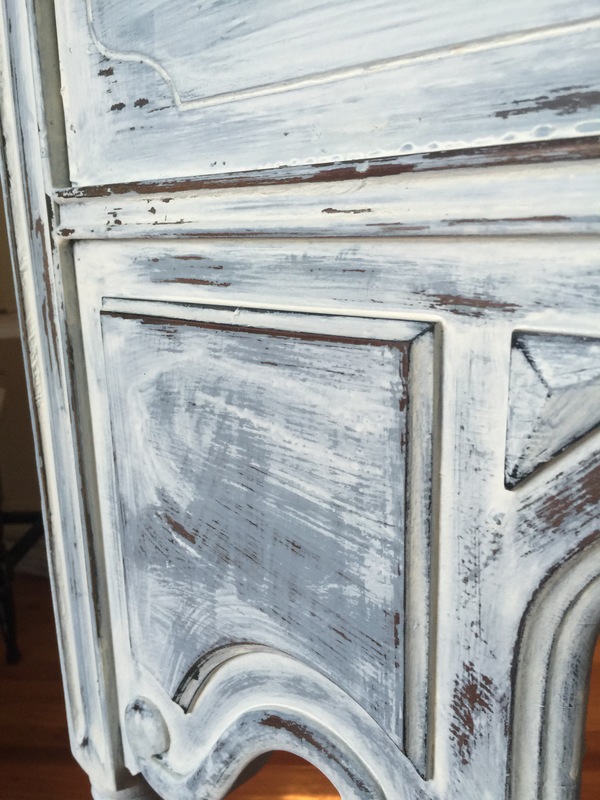 See how the blue color underneath comes through, but the cream color also retains its washy, weathered, worn look. And the color of the wood underneath is such a rich contrast to the blue and white. Again, here its chipping a bit…perfect! Now…what to use this piece for?? A bar? 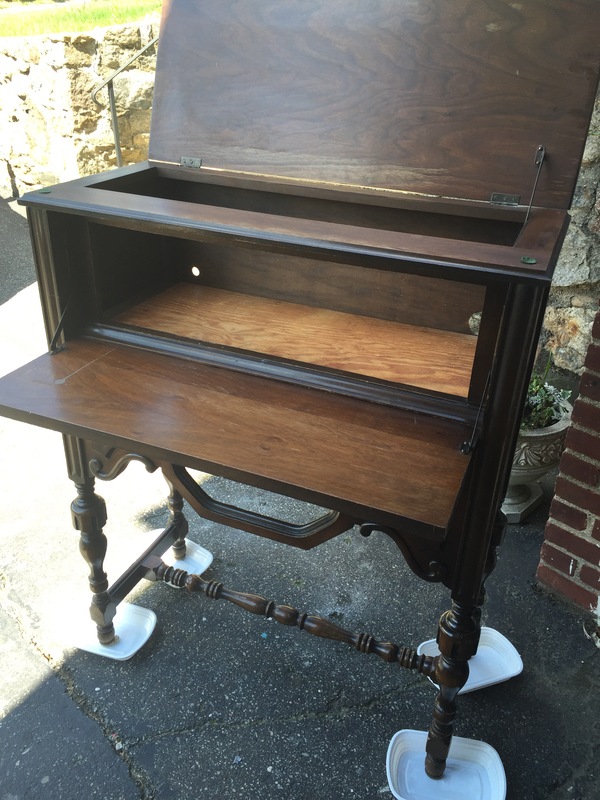 A desk? Both? I can’t wait! The piece originally had fretwork in the center opening, but it was badly damaged and I pulled it off. I decided to add some chicken wire that I had leftover from another project I had done and stapled it to the inside of the piece. That lent itself to the farmhouse look I was going for. 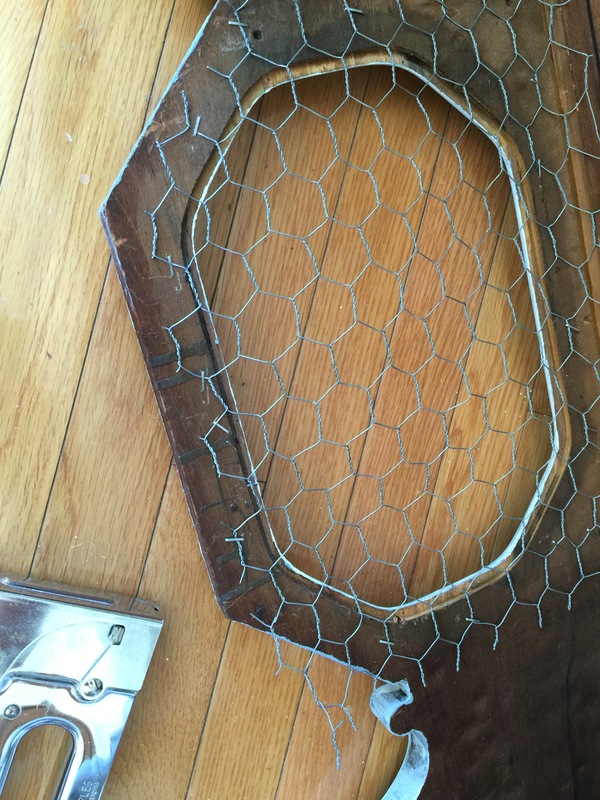 I used a pair of nippers to take off any remaining chicken wire hanging over. And here is this month’s contest project finally completed! I staged this photo so it could be shown as a bar or a serving piece for summer entertaining. I used the mason jar drink dispenser and the mason jars as glasses to give it a “Farmhouse Fun” feel! I used the Acri Glaze in matte just on the top as the sealer for protection from any spills or dings. The rest of the piece I used my Johnson’s Paste Wax for protection. I applied with a brush and removed the excess with a rag. 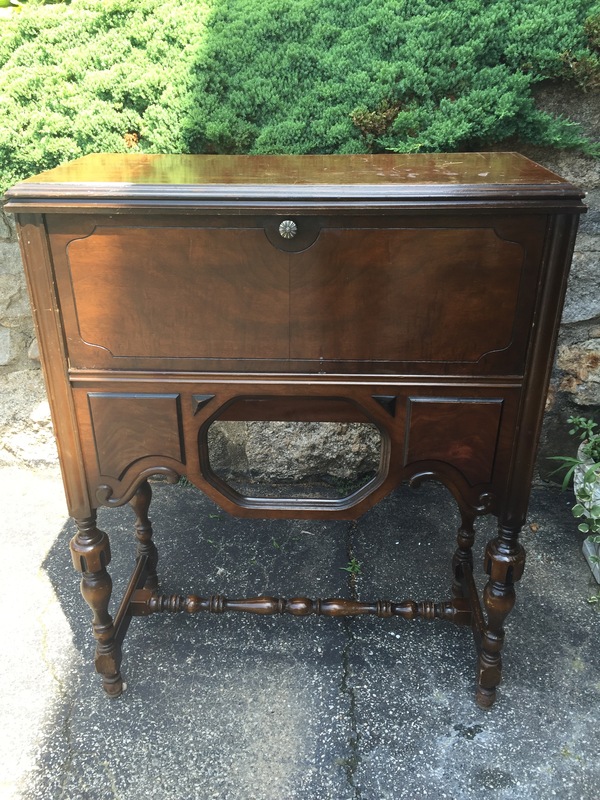 Here it is shown as a writing desk. I used some galvanized watering cans and, an agriculture poster I had gotten when I went on a vacation to Martha’s Vineyard. Some old vintage children’s books give it just the right touch. 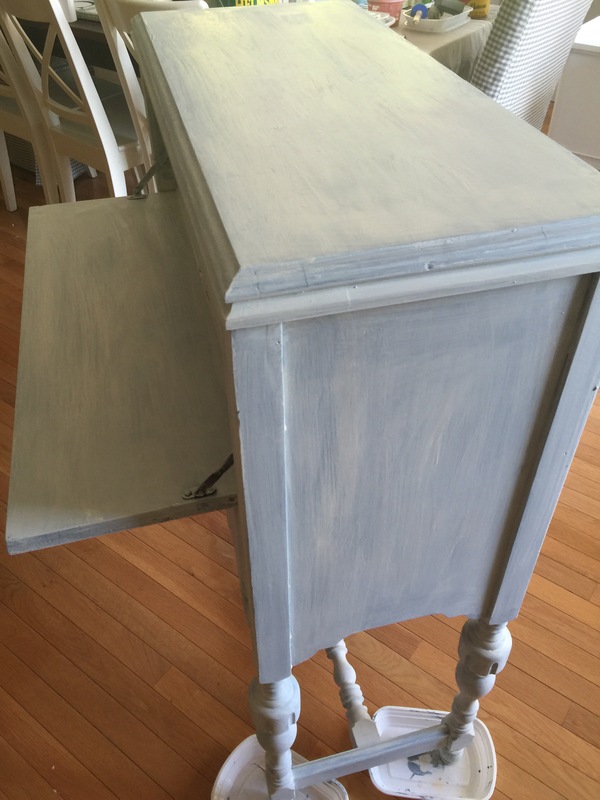 I received compensation from Old Fashioned Milk Paint in exchange for writing this review. Although this post is sponsored, all opinions are my own. This post contains affiliate links. This post may contain affiliate links. All opinions are 100% my own. I was given Saltwash product to complete a project for this contest. Summer is here! 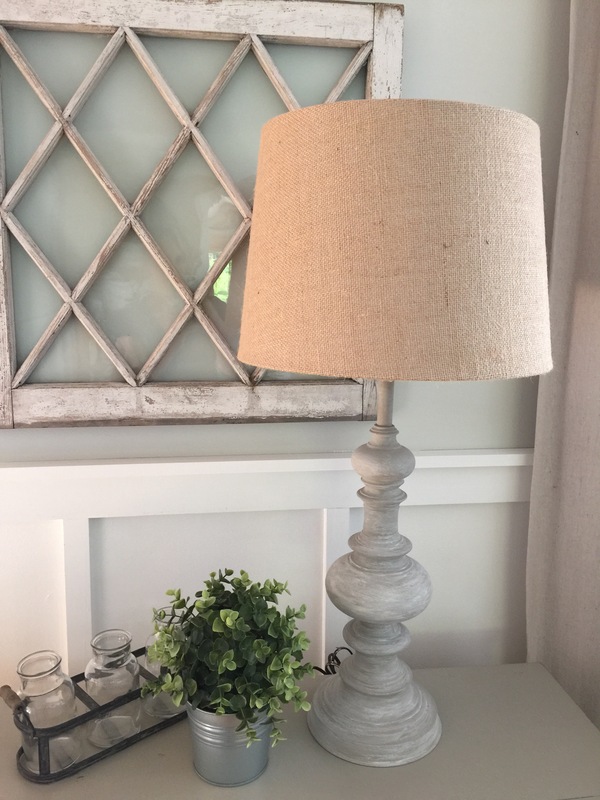 And there’s nothing better than creating a little DIY project with a coastal touch! Let me introduce you to Saltwash! If you haven’t heard of this fantastic product let me fill you in! 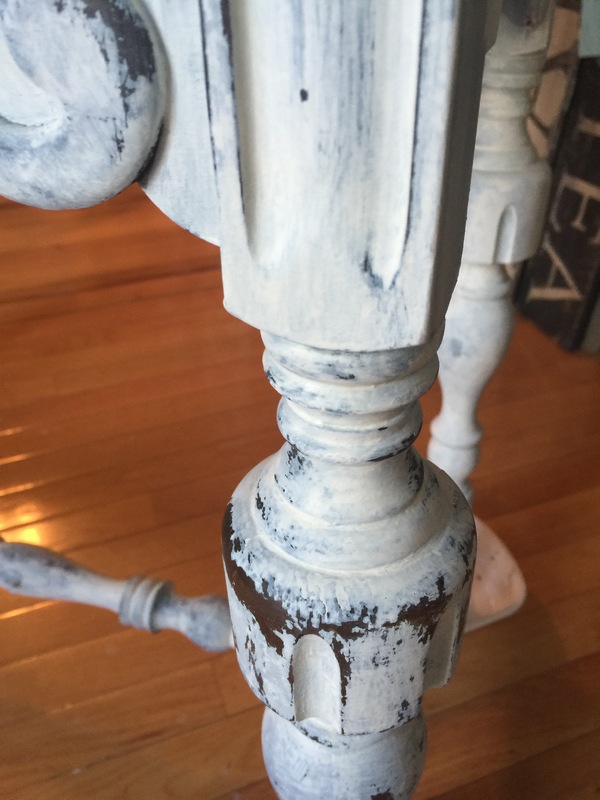 It’s a powder additive that you can add to any kind of paint and it gives your furniture an incredible, weathered, chippy, saltwashed, time worn textured look! 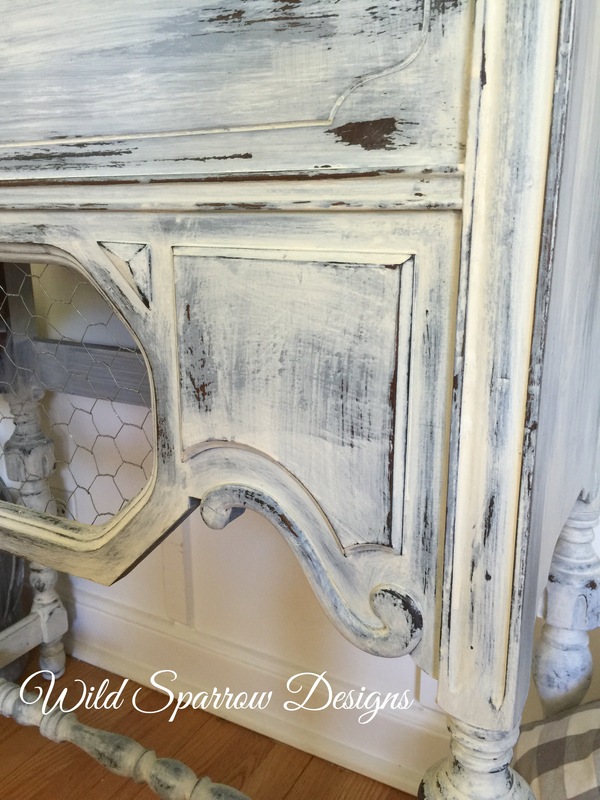 This month the Fab Furniture Flippin’ Contest had Saltwash sponsor their June contest and I was thrilled! The theme was “Coastal Inspirations”. I had seen the amazing effect Saltwash gives to furniture and accessories and I couldn’t wait to try this stuff out! This was the table I decided to work on. It was a freebie from a friend of mine and I thought Saltwash would work perfectly on here! 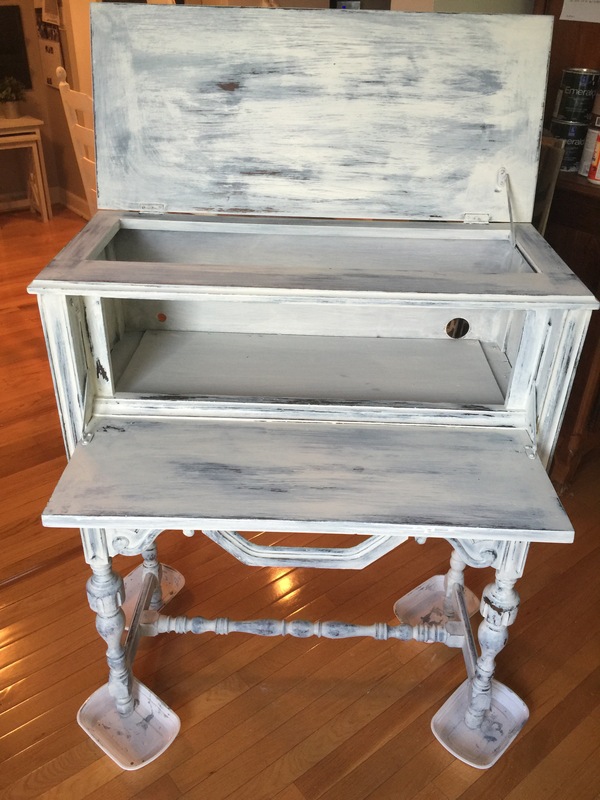 I had just given it a coat of white chalk paint. I had some leftover paint that my dad and stepmom had given me from a project they had done at their house. I can’t remember the name of the color, but it was a very bright green, almost a jadeite green color. It was an eggshell finish. This was the first color I layered on . This is the paint mixed with the Saltwash. You want to add enough of the product so that it becomes VERY thick like cake icing. When in doubt, add more. I just used my Wooster brush to apply the paint and Saltwash mixture. Instead of painting, you want to use a pouncing or dabbing motion when applying. Here you can see the texture starting to come alive. It adheres wonderfully and it dries very quickly. Here is the first layer of the green applied. Notice the chunky texture! This is exactly what you want to achieve. I was thinking about just going over the green with my white topcoat but I wanted more dimension and layering appeal so I decided to add another color over the green. Here is the second layer of paint and Saltwash. This was a bright tropical blue, also a leftover paint from a project! Also an eggshell finish. 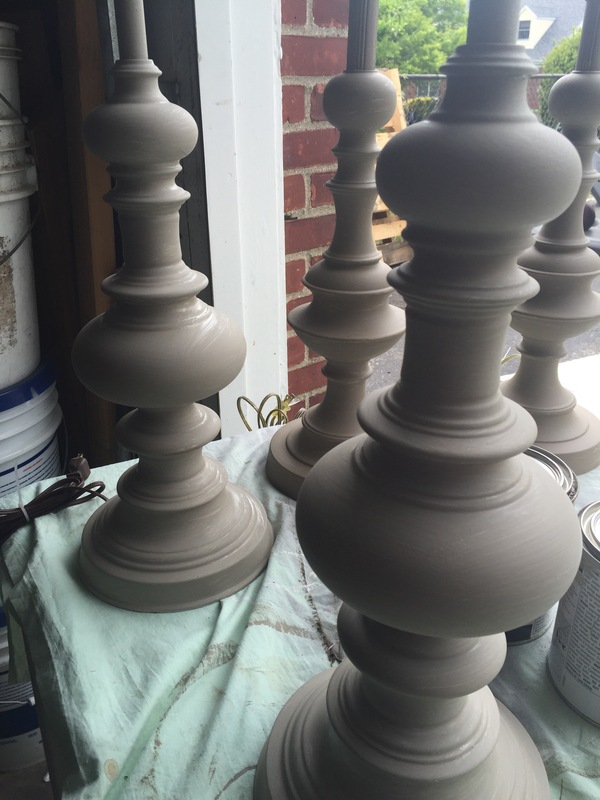 However, it doesn’t matter what finish you have on hand, Saltwash will mix with any kind of paint! I just glopped this on! Love this texture!! I let each layer dry thoroughly before adding the next. It didn’t take long, maybe a half hour or so before applying the next layer. So here is now a picture of the top coat applied over the 2 layers of color. This was just a white that I had on hand. I believe it was Snow White by Benjamin Moore. I didn’t add the Saltwash to the white. You use only the paint for the final top coat. I let this dry overnight. Look at all the crevices and divots! I am in love!! Another close up of the white over the green and blue. This picture is after I sanded with my palm sander! Look how the blue and green layers of Saltwash come through! It looks just like its been sitting in a coastal cottage for decades!! I sanded a lot on the edges because I wanted to bring out some of the wood tones as well. This is right after I applied my Johnson’s Paste Wax mixed with some dark Provincial Minwax stain. I just used an old sock and rubbed it in. I wanted an aged, distressed, stained feeling. I left the excess in the grooves and the corners. And here it is inside!! Doesn’t this look amazing? 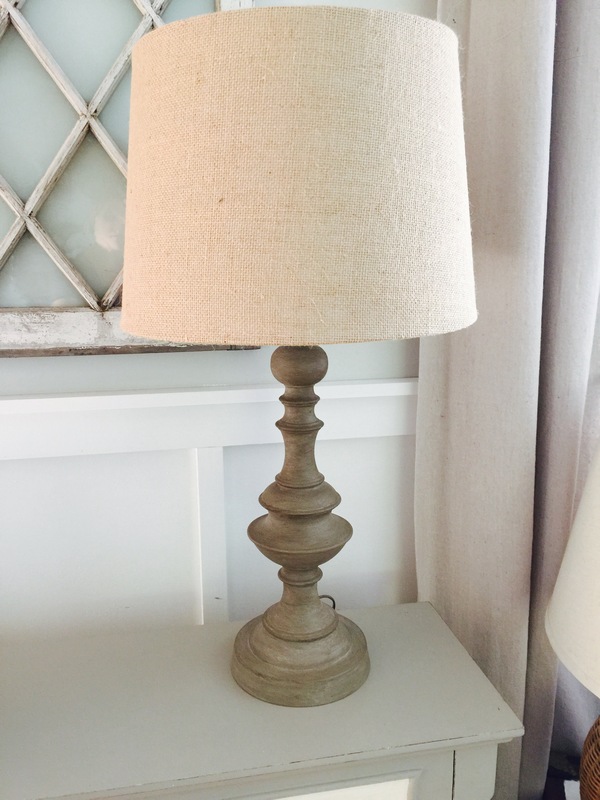 Beachy, weathered and worn and perfect! I was so addicted to this stuff I couldn’t help but create a “Beach House” sign as well with all the same colors I used on the table. I can’t wait to experiment on other pieces with other colors. You must try this Saltwash product!! Try it out. You won’t be disappointed! I am linking up to these wonderful blogs! This post contains sponsored links from Country Chic Paint. All opinions are 100% my own. This post contains affiliate links. 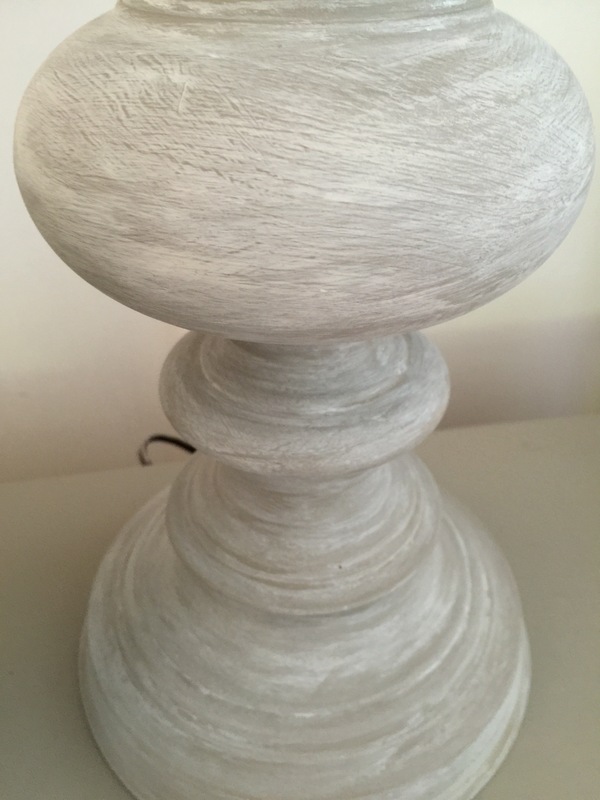 I have received paint from Country Chic to participate in this contest. Here we are again! Another Fab Furniture Flippin’ contest! 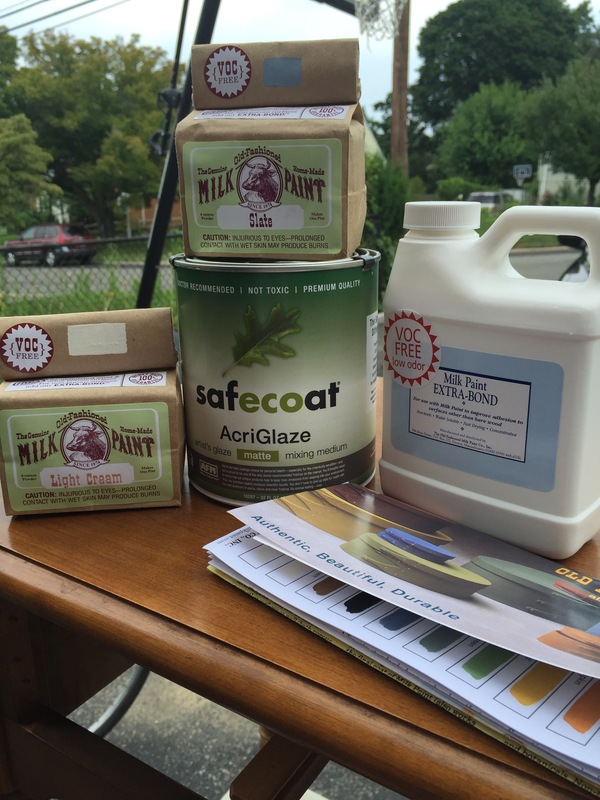 This month’s sponsor was Country Chic paint! The theme was “Bling Bling”. We needed to create a piece using their metallic cream paint. I couldn’t wait to get my hands on this paint! I was lucky enough to be able to choose the paint colors I wanted to work with, and I chose Vintage Cupcake and Metallic Cream in Belt Buckle. This is how I received the package from Country Chic paint. the packaging and the details were beautiful and so professional. 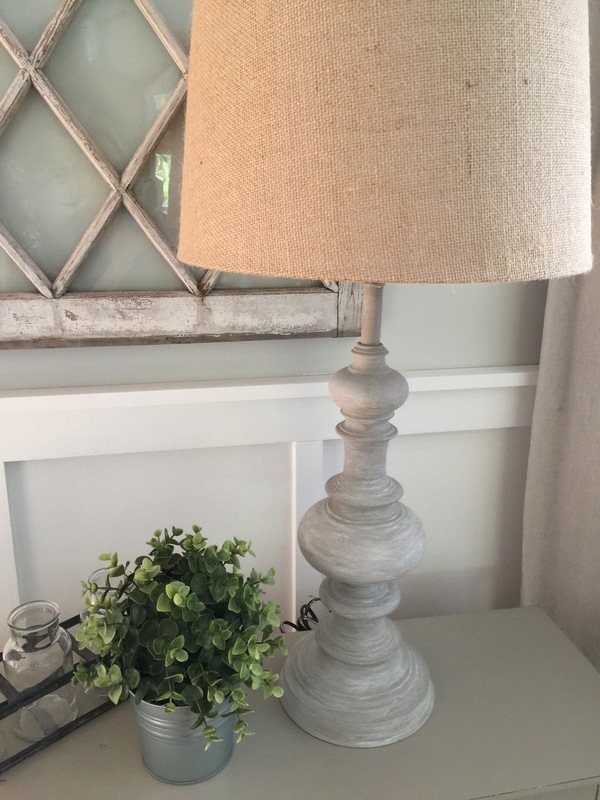 Here are the two colors I chose for this month’s contest from Country Chic paint: Vintage Cupcake and Belt Buckle metallic cream. I also received a beautiful paintbrush as well! Which has become my new favorite! 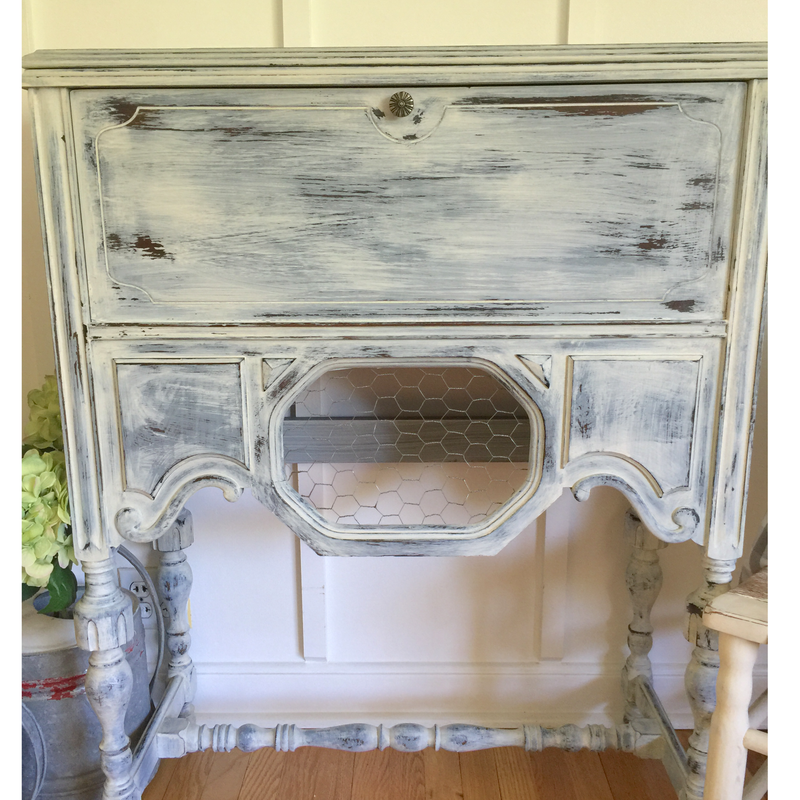 I have been waiting for some time to paint this adorable french provincial nightstand which I had gotten for free and I knew that Country Chic paint would be the perfect choice to make this piece Bling! I chose Vintage Cupcake which is the most beautiful shade of pink and Metallic Cream to give that extra little glam chic. It was exactly what I envisioned on this piece. I wanted something a little glamorous, very french, a little flea market chic, and definitely girly. I also had a beautiful mirror that was originally made to go with a vanity and I decided to paint this pink too, to work with the nightstand. I cleaned this piece thoroughly with TSP and soap and water. Then I did a little sanding, not much, just enough to get a tooth on the wood. 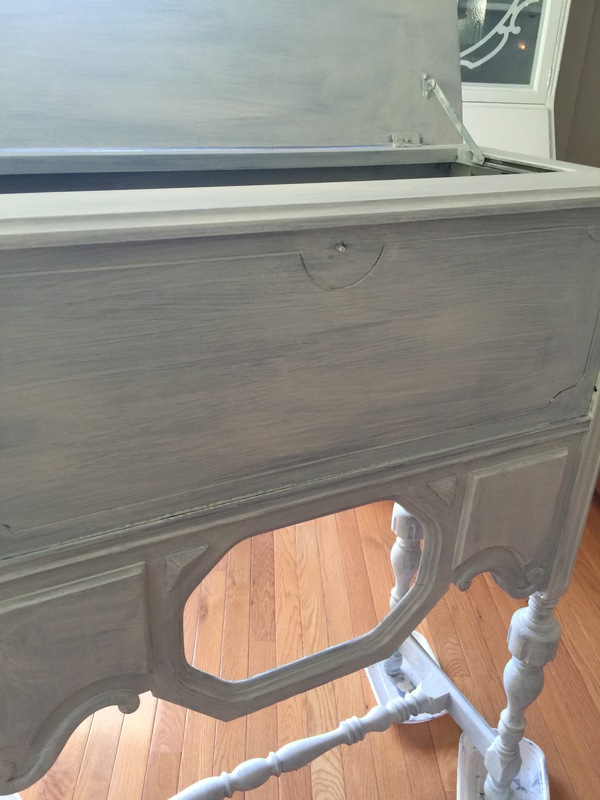 This is after one coat of the Vintage Cupcake color. The paint had to be stirred very well before using, but was a really nice consistency and went on very well. Wonderful adhesion and dried very quickly. This was after 2-3 coats of the Vintage Cupcake color. It really went on beautifully and the pigment is delightful! 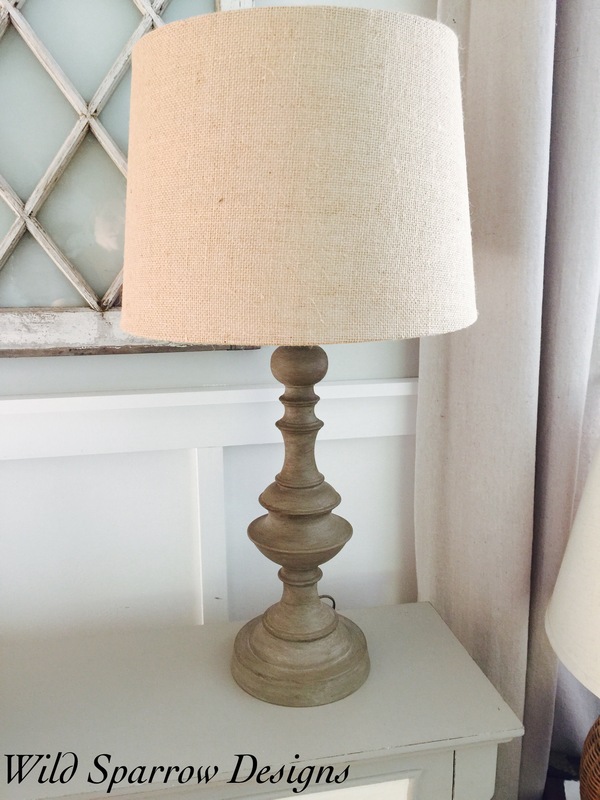 I sanded down the edges to give it more of an aged, distressed feel. This is after using the Metallic Cream paint in Belt Buckle. I painted the hardware and then I did a dry brushing over the entire piece. A detail of the dry brushing on the front drawer. A closeup of the Belt Buckle Bling! The dry brushing is done by putting just a small amount of paint on your brush and then swiping along very lightly with your brush until you get the effect you like. I did a bit of a crosshatch motion on the sides with the Metallic Cream. I decoupaged the inside with a pretty graphic I found on The Graphics Fairy website. I lined the inside of the drawer with some leftover black and white toile I had. 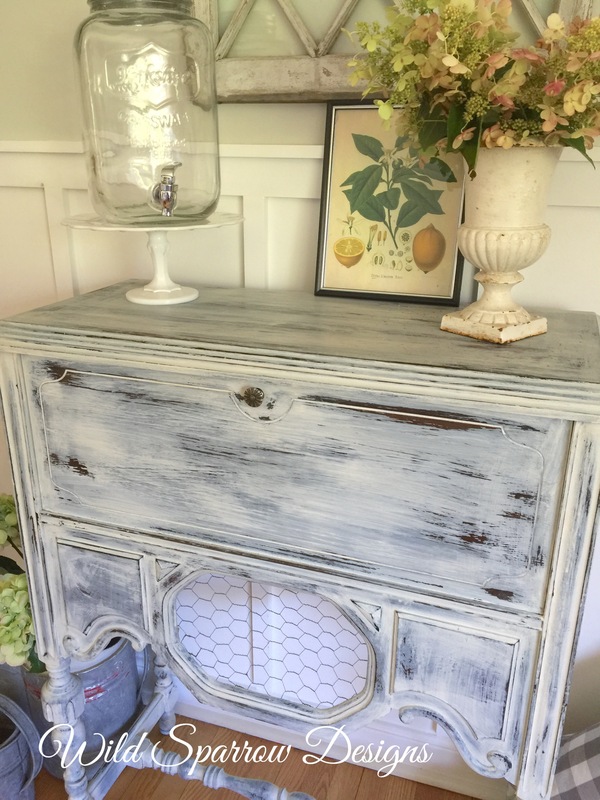 I wanted a very French Shabby Chic flea market style for this piece. I think I achieved it! This is a detail of how the metallic cream really pops the carving on the mirror. I love the pink and the belt buckle color together! I did some distressing on the mirror as well, and it was so easy! 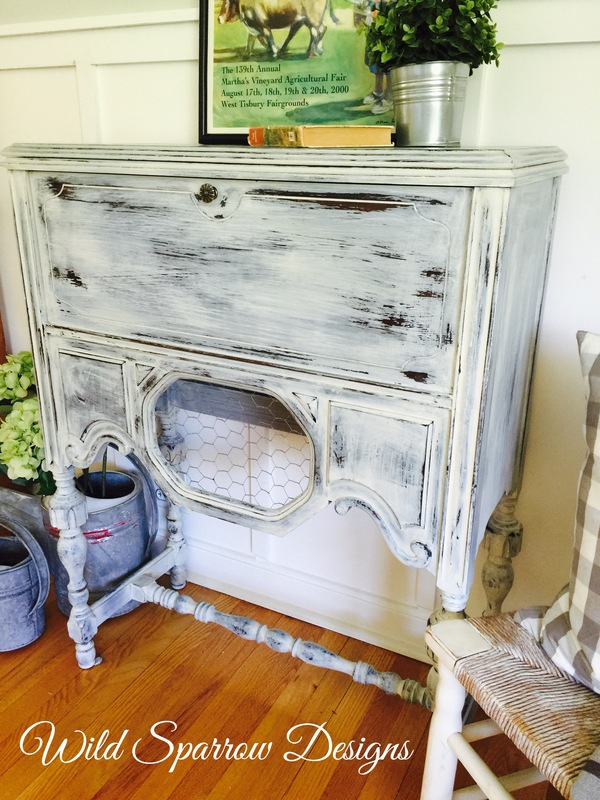 So french , so shabby , so lovely!! I hand-lettered the top of the nightstand with some french typography and I also added some pretty decoupaged flowers! I used Mod Podge to attach the flowers and I sealed with a matte sealer for protection. I distressed the hand lettering and I also painted a black bow on the top left corner. 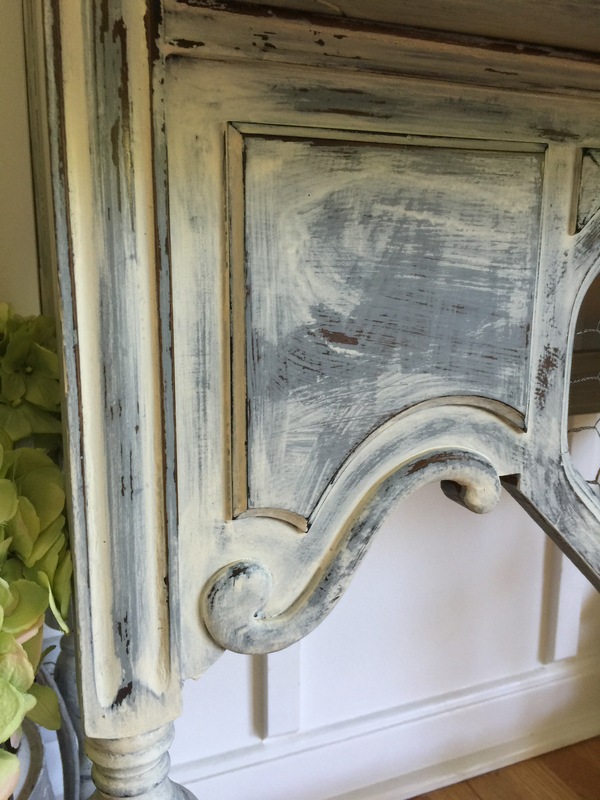 The metallic cream paint is very thick and goes on like a dream! The metallic is not too harsh, and it gives a subtle glow to the piece, with just enough bling to pop the details. I am beyond thrilled at the way this piece turned out! This paint exceeded my expectations! The coverage, the drying time, the hue of the pigment and the fabulous brush were a pleasure! Doesn’t this look like it came out of a chalet? I just love it! Sorry about my leg in that one! 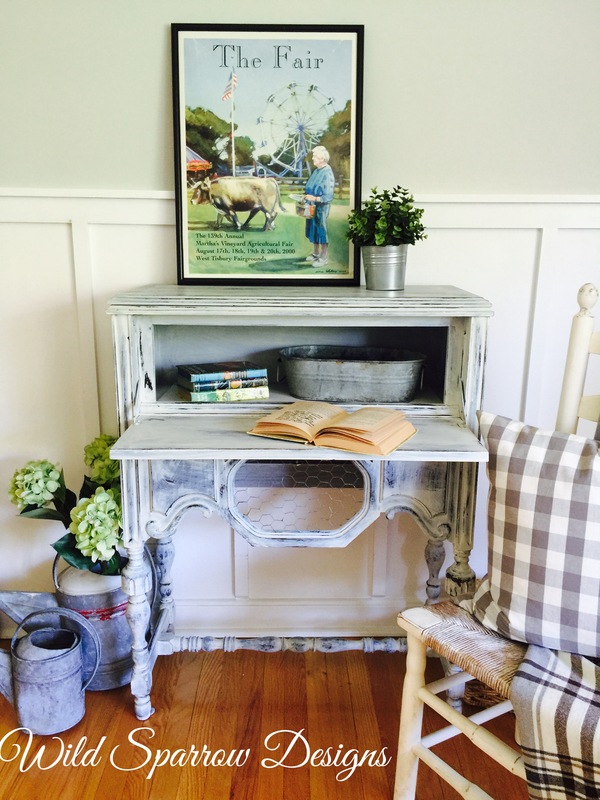 Visit the Country Chic paint website to order your paint today! 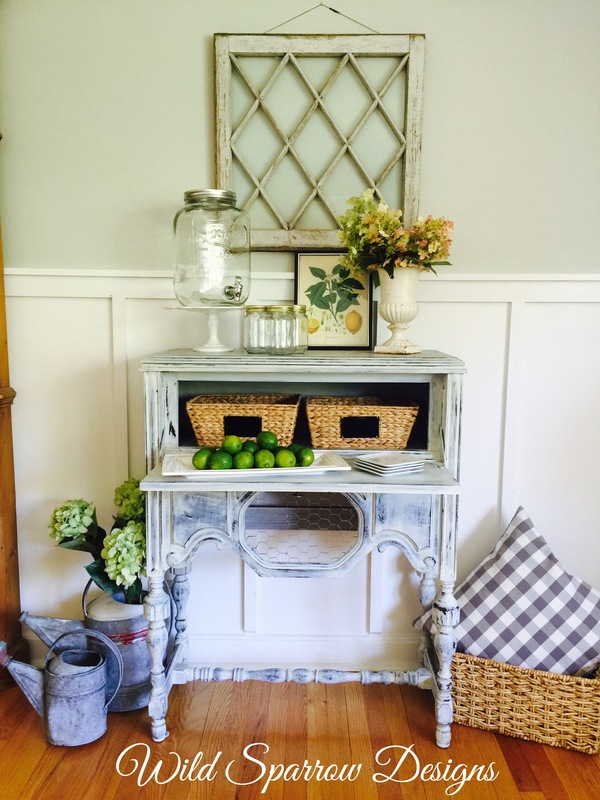 Go check out the other entries at these gorgeous blogs…. 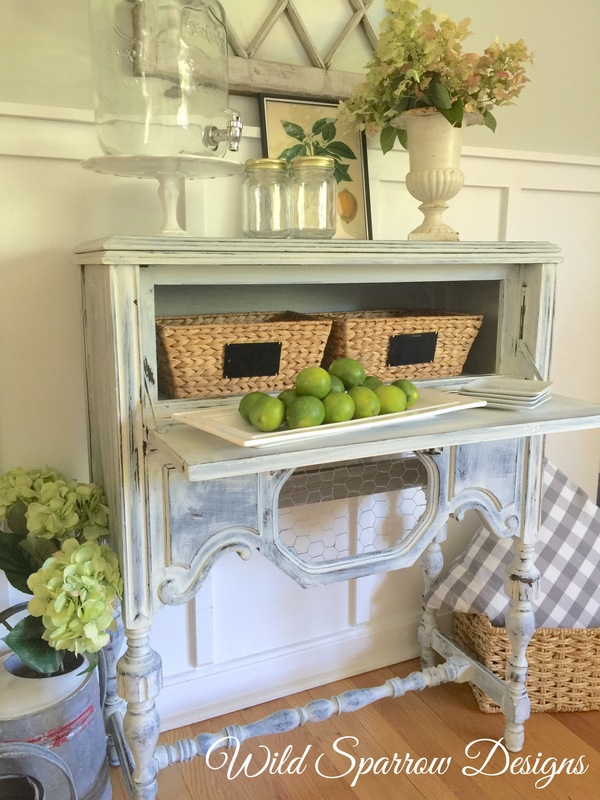 This beautiful buffet started out as a simple piece, but my client wanted it painted a light gray color and more distressed looking. 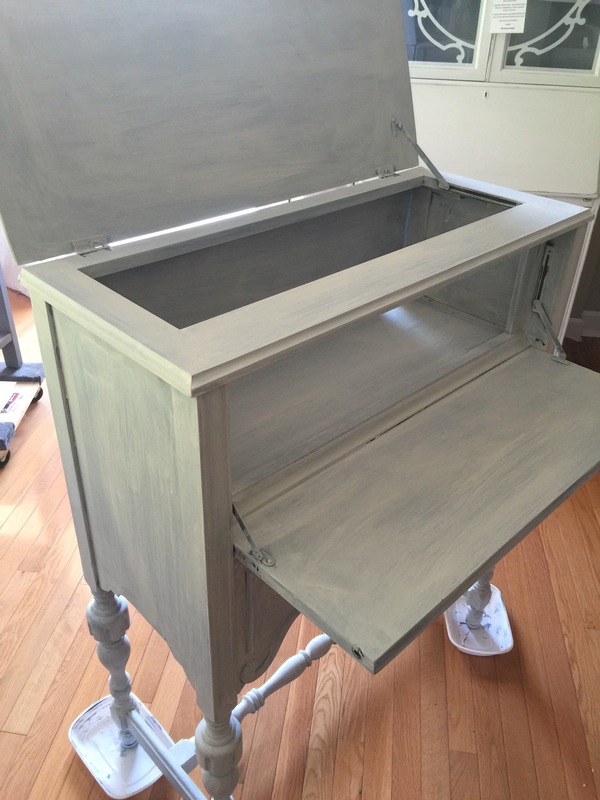 This was my first time using Rustoleum’s chalk paint line. I used the Aged Gray Color. This is how this buffet started out. 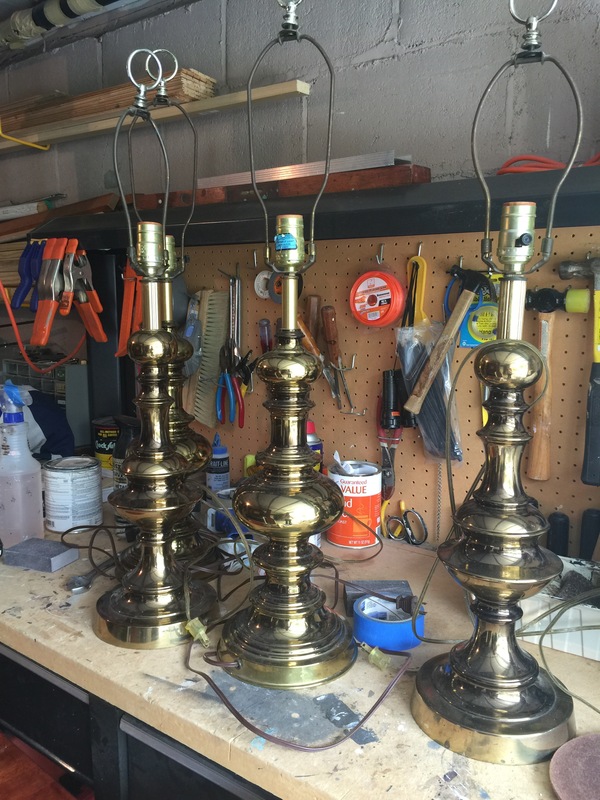 The center panels were made of a molded metal which were gilded. I sanded the piece thoroughly, even though the paint claims to adhere to a glossy surface, I never trust that it will. You are much safer giving your piece a good sanding to ensure that their is a “tooth” to your piece. This means that the paint has something to adhere to. I used my palm sander to make quick work of sanding this piece. Then I started taping off the areas I didn’t want to get excess paint on. Here are the doors sanded and taped ready to be painted. This is the paint and the clear sealer I used. I think the paint went on very well, and dried quickly. I didn’t prime first. I used my Wooster brush and a foam roller to apply the paint. This was after 2-3 coats of the Aged Gray. 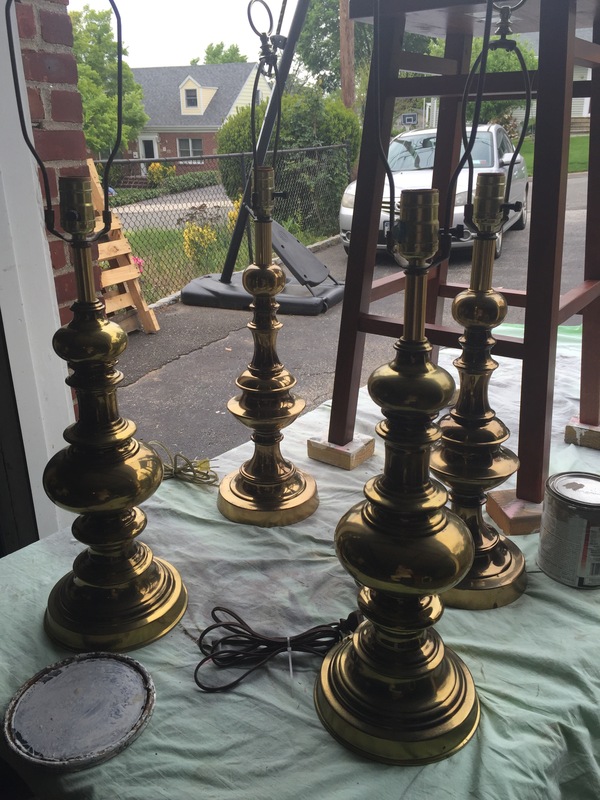 The coverage was great and I lightly sanded between coats to get a really nice buttery feel to the final finish. Here is the door done with the Aged Gray. 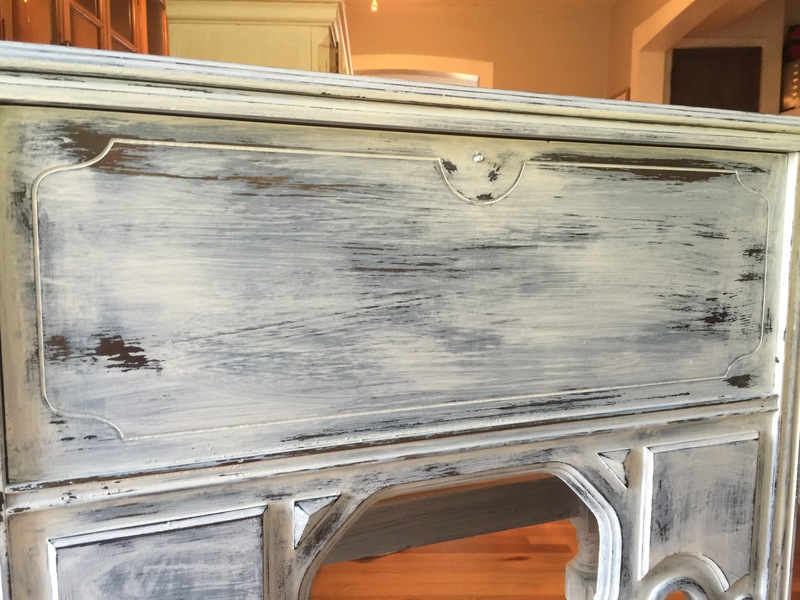 My client wanted a very distressed look to this piece. So I started with my sanding sponge just on the edges and then increased in some spots using my palm sander to give more dimension and texture. 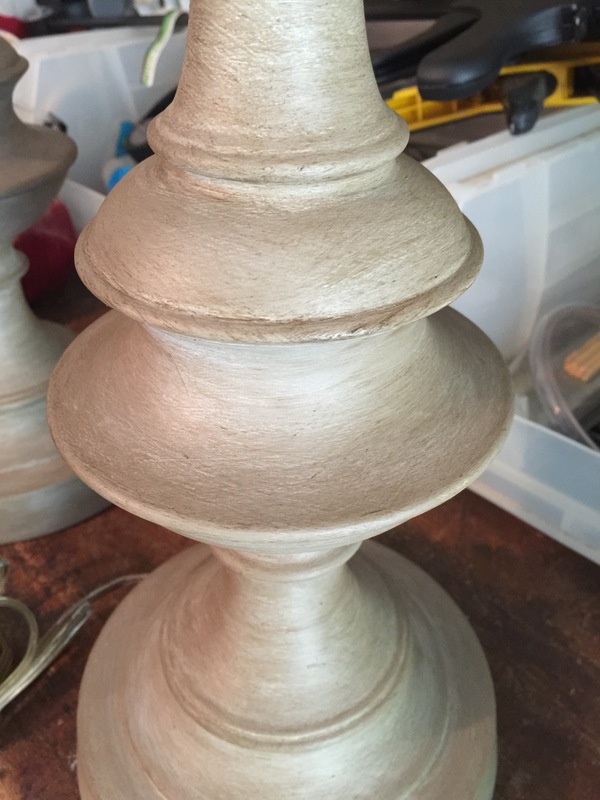 After sanding the piece, I used Minwax stain in Provincial to give the piece more of an aged feel. I applied it using a rag, and then used a clean rag to take away the excess. Here is the piece after applying the stain. All I did was use a rag dipped in the stain and then wipe it on. Then I wiped away the excess with a clean rag. Lately I’ve been painting signs in addition to painting furniture. This is a sign I made for a friend’s new grandchild. I used a combination of hand painting, image transfer and decoupage to create a shabby chic weathered look for this baby announcement. For the image transfer I used Mod Podge. Below is an example of how i created the image transfer. This isn’t the image I used for the baby sign, but I just wanted to show you an example of what I use. This image came from The Graphics Fairy website. She has such wonderful images that are copyright free. This is one of some French Typography. Notice how the image is in the reverse. When you are doing an image transfer, you need the typing to be in reverse so when you apply it to your surface it comes out correct. If it’s just an image you don’t need it to be in the reverse. You want to cut out your graphic as close to the image as you can, trying to leave as little white showing as possible. This was printed on regular white printer paper from a laser printer. After cutting out your image, you want to apply it to your surface. 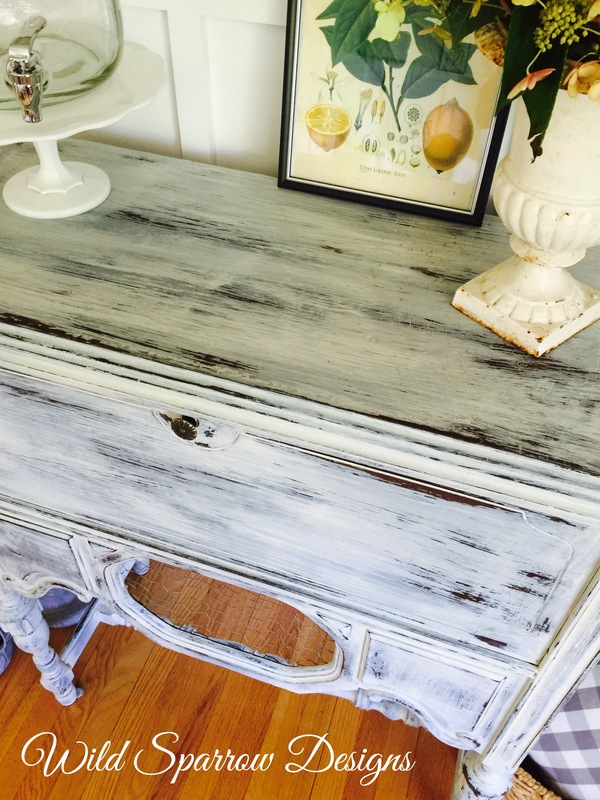 In this case, I had used a tin box that I had painted with chalk paint. Use a foam or a chip brush to apply the Mod Podge to the front of the image, not the back. Make sure you press down firmly and get out all the bubbles and wrinkles. Let this dry overnight. When it’s ready, you will take a damp/wet sponge and press it over the image. Then, you will start rolling off the excess paper and leave the image behind. You have to do this carefully and slowly at first, making sure you are not taking off the image. It takes a little practice, but when you get going its really addictive! You’ll know all the paper is off when there is no more white haze over the image. I use either Mod Podge to seal this or a Polycrylic. 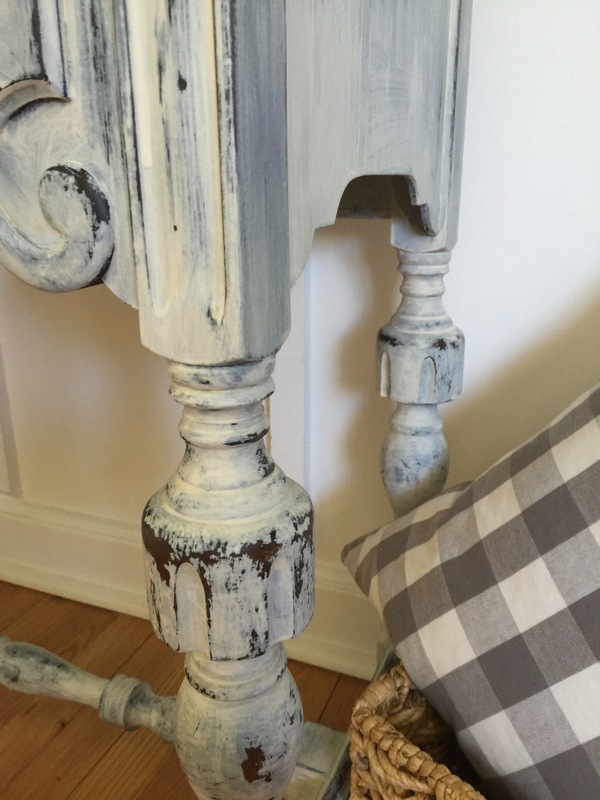 I used this wonderful chalk paint from Pure & Original for this project. I had painted the wood I used for the sign black first, and then I used the color Aged Paper over it. I sanded it very well with my palm sander to get a weathered, dry brushed look. I hand-lettered the name, date and statistics of the baby. I just used black acrylic paint and a long thin brush to paint the lettering. I use carbon paper and I trace the outline of the lettering and then fill in the outline. For the black and white images I used the image transfer process above. The color images of the roses, etc I also found on The Graphics Fairy website. I cut them out using a small scissor and applied them using Mod Podge as well. After everything was dry, I used the Mod Podge as a sealer over the entire sign. I attached some vintage pink ribbon to the hardware on the back and it was complete! Disclosure: This post contains sponsored links from Pure & Original Paint. All opinions are 100% my own. This post contains affiliate links. 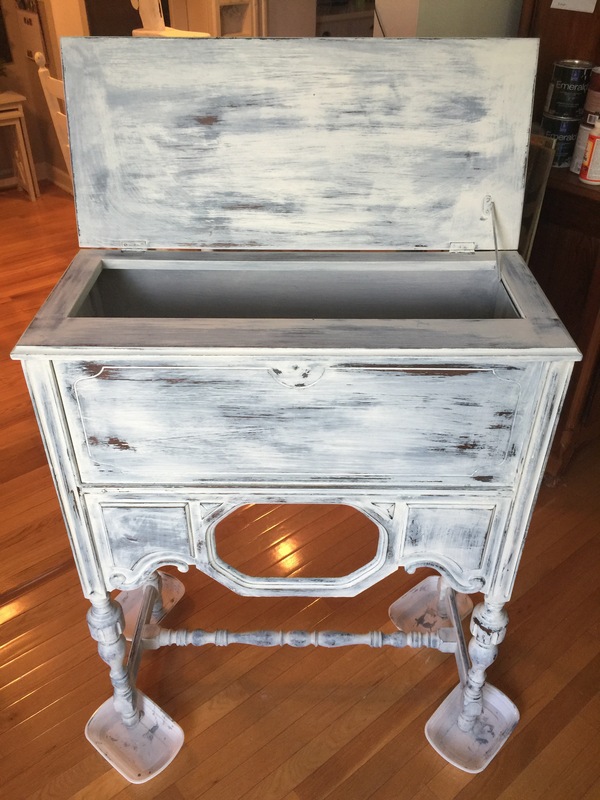 I just recently joined the Fab Furniture Flippin’ Contest group on Facebook and luckily I got to join and participate in their April Contest sponsored by Pure & Original Classico Paint! I was so excited to try out this fabulous brand of paint! The April theme is Pure Colors, Original Elegance. I was able to order 2 quarts of any color so I chose Aged Paper and Green Room. 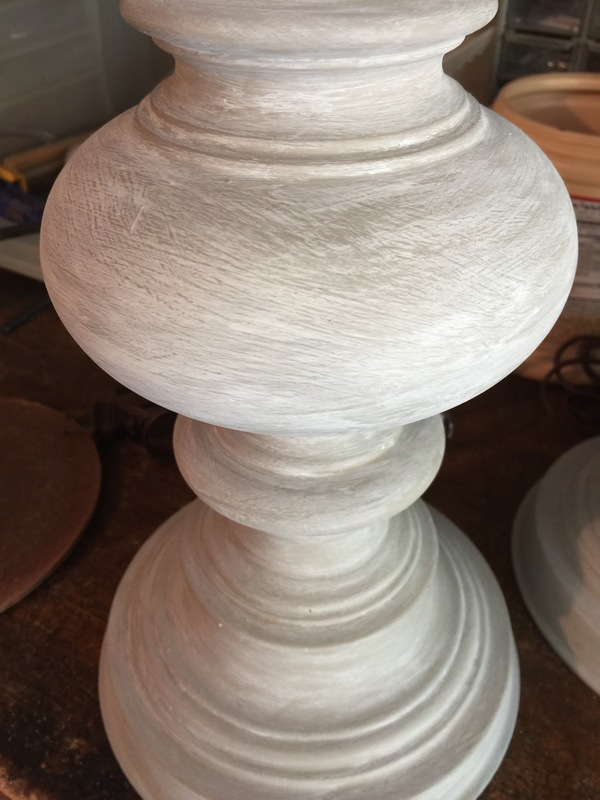 What’s so wonderful about this Pure & Original Classico Paint, is that it’s 100% mineral chalk and water based paint. The colors are deeply pigmented and the texture is very thick, no sealant is needed even for outdoor use! It also comes in over 118 colors. So this was the sorry state of affairs when I came upon this little kitchen table on the side of the road. I made it just in time, I could hear the garbage truck rounding the corner! It was in pretty good structural shape, but not so much in the surface shape. 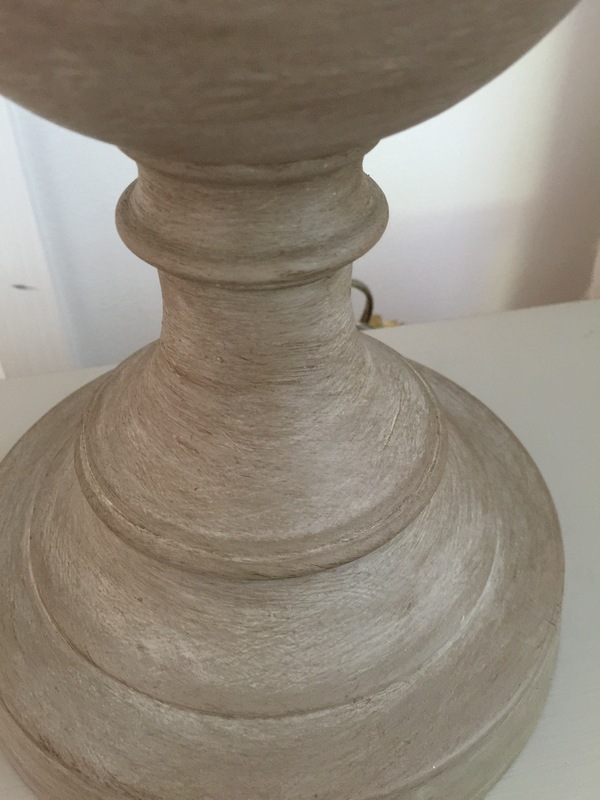 I knew that I wanted a chippy, distressed, weathered, elegant farmhouse feel and I had a feeling that Pure & Original Classico paint was the perfect paint to achieve that finish! 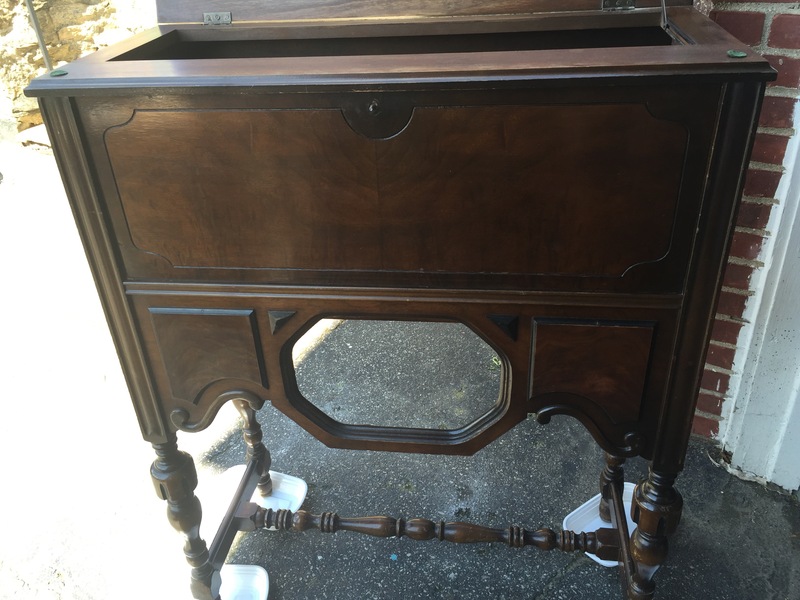 I quickly grabbed it and brought it home where I gave it a thorough cleaning and scrubbing. It was pretty disgusting. It had layers of old peeling paint in various states of decay and wear, but I knew I could use this to my advantage. 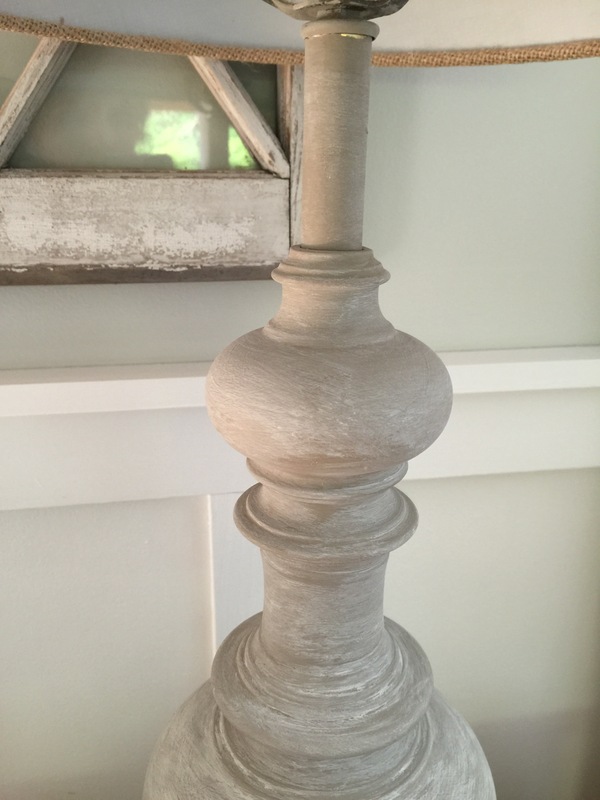 I had wanted to convey a shabby, farmhouse chippy finish anyway so I knew this could work in my favor. I used Citristrip to take off the many layers of paint off the top and then I used my palm sander to get off the rest. I wanted to keep the top wood. 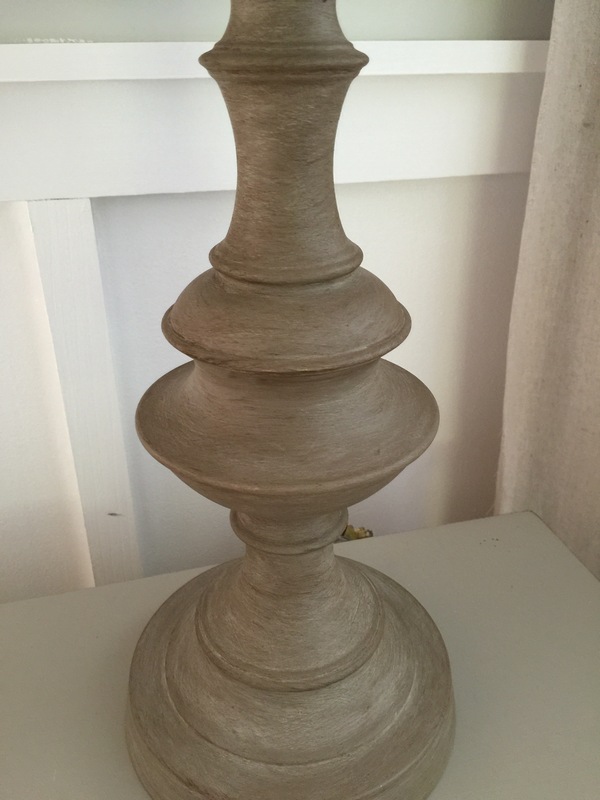 I wanted to try to just oil the top and keep it a light color, but it had a lot of burn marks on it, so I decided to use a few coats of Rustoleum’s Kona stain on the top instead. Thankfully, that really covered the top well, and you can hardly see the marks. If you notice the blue color, on the photo above, that was the original color of the paint. It didn’t look like the color I had ordered but I was undeterred! I used some spring green tint to darken the color to get more of a jadeite green color and it worked out perfectly! The paint covered in one coat! Even over all those other coats of god knows what on there! The adhesion is supreme. 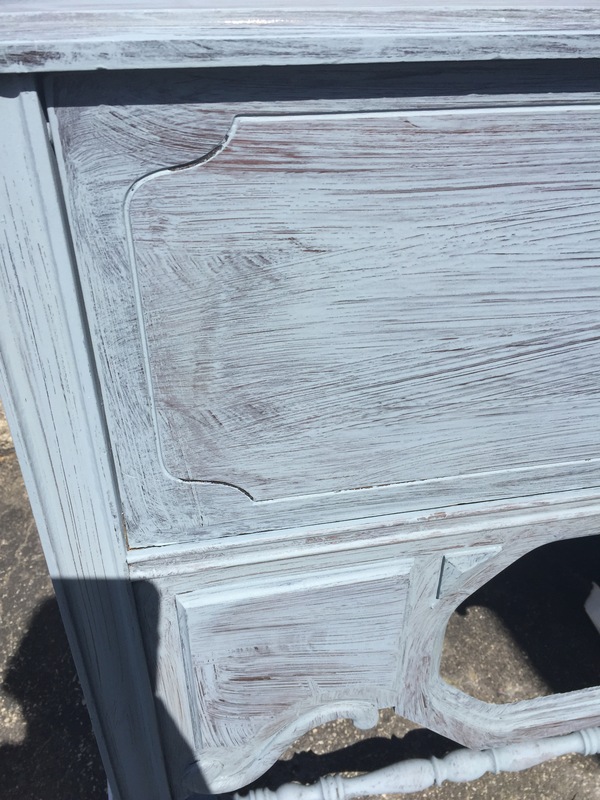 This table had a lot of coats of peeling, chipped paint on it and when I used the Pure & Original Classico over it, it stuck like glue, and had a very matte, velvety texture. This is the packaging by the way…gorgeous and professional! This is the can of the second quart I ordered, Aged Paper. I got this color because I wanted to use this as a layer over the green color to give the feeling that the table had been weathered and worn and maybe used as a potting bench/farm table over the years. It worked like a charm! This is the end result! Look at this finish! I am so in love with this piece! This is exactly the feeling I wanted to get on this table. I brushed on the Aged Paper color after I had done 2 coats of the green, and then heavily distressed at the edges and a bit on the flat areas. The texture is like butter now. The paint feels like velvet! 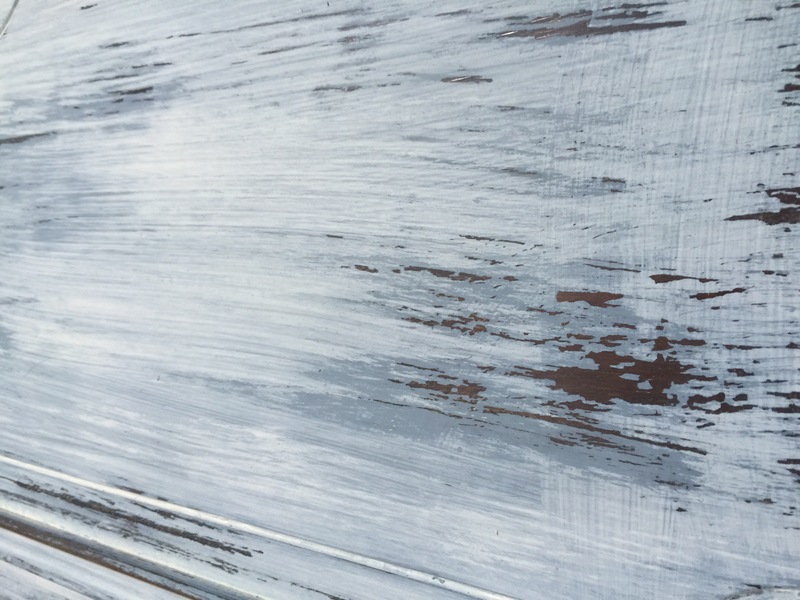 The detail on this picture shows how the Pure & Original Classico Paint distresses so easily and professionally. Even though there are many other old layers on there, the Pure & Original covers so well and really looks like its been there for centuries! Just the look I wanted! I just used a soft sanding sponge to take the edges down and the flat areas too. 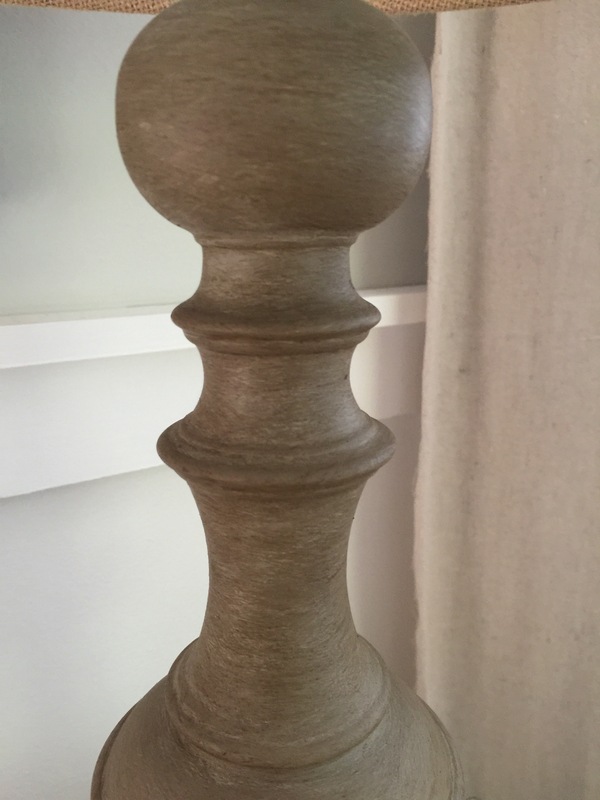 I used a small amount of Minwax Jacobean brown stain over the paint with a rag and then wiped it off just to give it more of an aged and antiqued feel. I left the stain in the cracks and crevices. You can see the layers of the black and the white and wood underneath.